\a. Mary may be tired after all that swimming, since she is not used to exercise. \b. 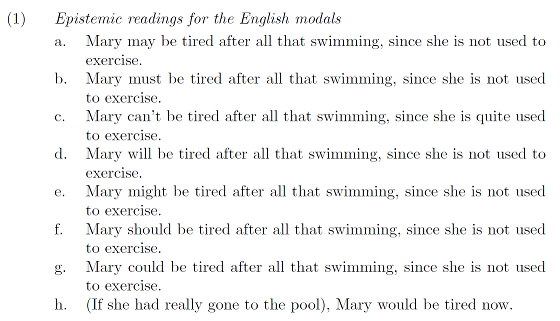 Mary must be tired after all that swimming, since she is not used to exercise. \c. Mary can't be tired after all that swimming, since she is quite used to exercise. \d. Mary will be tired after all that swimming, since she is not used to exercise. \e. Mary might be tired after all that swimming, since she is not used to exercise. \f. Mary should be tired after all that swimming, since she is not used to exercise. \g. Mary could be tired after all that swimming, since she is not used to exercise. \h. (If she had really gone to the pool), Mary would be tired now. Output comes fine, but the baseline space, i.e., leading space is not come correctly for both places, one place it came as 12pt and in another place it came as 11pt, but it should be as 12pt, please refer the below image for clarification. The linguex macro defines three basic commands: \ex.,\a., and \b.. The first two generate list environments. The third functions basically like an \item. This means that the first entry of a list is set with \a. 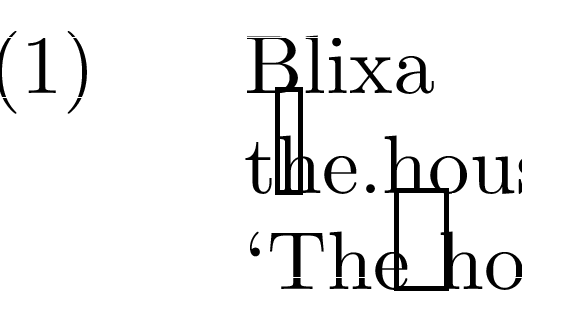 while every subsequent entry is set using \b..
Linguex additionally provides the commands \c., \d., \e., and \f. to achieve a WYSIWYG-effect. They do the same as \b.. There are no commands defined for the letters following f, which is why you get an 'undefined control sequence' error. The following MWE therefore poduces what you want to achieve. \b. Mary can't be tired after all that swimming, since she is quite used to exercise. \b. Mary will be tired after all that swimming, since she is not used to exercise. \b. Mary might be tired after all that swimming, since she is not used to exercise. \b. Mary should be tired after all that swimming, since she is not used to exercise. \b. Mary could be tired after all that swimming, since she is not used to exercise. \b. (If she had really gone to the pool), Mary would be tired now. Not the answer you're looking for? Browse other questions tagged errors linguex or ask your own question.